Exeter-based firm, GX Accounts, is passionate about being forward-thinking. When qualifying as an Accountant in 2007, founder Glenn Redler was one of the youngest Chartered Accountants in the country at the time. Glenn started GX Accounts in 2016 after seeing that no-one else in the South was using a cloud-based approach. I began my career in accountancy in 2002 as a trainee at a firm in Exeter. In 2007, I qualified with The Institute of Chartered Accountants in England and Wales, and became one of the youngest Chartered Accountants in the country at the time. I started GX Accounts two years ago to help businesses take the pressure of managing accounts and tax requirements off their shoulders. One of the reasons why I started GX Accounts was because no-one else in the South West were using cloud-based software. From day one, my business was all about bookkeeping in the cloud, providing clients with real-time data and being a proactive rather than reactive accountant. It was also a case of talking Quickbooks Online. I was able to incur the costs of using Quickbooks Online, which attracted a lot of attention from the get-go. About 6 months prior to GX Accounts, one of my best mates started to use QuickBooks Online for his bookkeeping. The benefits of an automated bank feed suddenly dawned on me. While I hadn’t looked into add-ons, I looked into his account as a way of understanding the system to see the possible benefits. This was the tipping point on which way to go about business, and where the marketing would go. Now, when we go to networking events, we try not to be the boring accountants at the end of the day. If I meet someone who tells me they are rubbish with their accounts, the very first thing I'll say to them - actually before asking whether they've heard of Xero, QuickBooks Online or Sage - is to look at Receipt Bank. I'll show it to them on my phone with a few receipts. Straight away, it blows them away. If they're interested, even if not straight away, they'll sometimes come back after a few months. If I meet someone who tells me they are rubbish with their accounts, the very first thing I’ll say to them ... is to look at Receipt Bank. I’ll show it to them on my phone with a few receipts. Straight away, it blows them away. All the simplicity, accessibility and real-time data of cloud-based stuff means we can provide clients ongoing support and value throughout the year. When starting out, I read that 80% of clients find their accounting firm through word-of-mouth. Now that we’re more established, word-of-mouth is filtering through. Cloud-based accounting both makes us look forward-thinking, and provides great success stories. We are very lucky in that our clients have shared testimonials and tell their friends and colleagues. That’s bringing in the work. Having the cloud, using Quickbooks Online and Receipt Bank, means providing a personal and proactive service. It allows me to be a part of my clients’ business, both by having that connection and also selling it as a USP. It’s what I say when people ask me what I can bring to the table. It’s not about me being your local accountant who you see once a year. It’s about being a part of what you do and your team. For me, that’s why I do that. It’s actually nice to feel part of a team. Now with a couple of members of staff, I hope they’ll be keeping that kind of connection with our clients. For us, providing great customer service goes hand-in-hand with working on the cloud. If you can keep on top of one thing, the more contact you have with your clients. Then, customer service is easy. It just works. Cloud-based accounting is one of our key USPs. It’s all about this technology and using it - you’d be surprised how many clients love it. They don’t want to be writing in a book or trying to type numbers into a spreadsheet. They want quick and easy. Cloud-based accounting slots into this perfectly. As well as QuickBooks Online and Receipt Bank, I use GoCardless to add efficiency. This means I can wake up on the first day of the month and before I've got out of bed, have all sales invoices sent to customers. I don’t have to worry about them paying. The payment comes in a week’s time, once it’s been collected from my clients. I also started using Invoice Fetch with clients (a new Receipt Bank feature that automates document collection for recurring payments). While it is difficult to tell everyone about it - particularly the older generation, for whom it can be tricky asking them to add bank details - other clients really appreciate not having to download their mobile phone bills. These are usually the most difficult - people often receive them just on a text message. With Fetch, it goes straight into their inbox. Once they’ve seen how easy it is with a mobile phone supplier, they can roll it out to other suppliers like electricity bills. Often they are astounded. It quickens the process for everyone. For us at GX Accounts, instead of spending 2 days every quarter to do bookkeeping for a client, it now takes just 3-4 hours. This time-saving is terrific, plus saves time chasing clients for information too. One of my clients runs her own business and takes Fridays off to do admin and spend time with family. She has a little daughter who’s coming up to 2. I introduced her to Receipt Bank after guaranteeing it would save her time. On average, she would spend 3 hours on bookkeeping. By using Receipt Bank as an add-on, she saved 2 hours per week. Now, she does all of her bookkeeping in less than an hour, takes her daughter out swimming, goes out to lunch and everything is sorted - ready to go. She spends another 20 minutes sorting through receipts and uploading it to Xero, then has 2 more hours to spend more time with her daughter. That time is priceless. We are currently growing our client-base of forward-thinking growing businesses. We do not take every client who comes through our door. Instead, we choose who we want to work with - something that allows us to enjoy our job. In 2-3 years, I want to be in a position where I have a bigger team. If anyone says “Oh I am thinking of using Quickbooks Online, do you know any accounting firm that does it?”, we are the first name that comes up in the area. And this is already happening on social media, where people will tweet “Do you know anyone in Exeter using cloud-based accountancy?” and we will be the first to be tagged. Ultimately, I want to grow and enjoy work. Plus, I’d love to have a holiday in January - that would be the target. And the ways things are going, that’s now achievable. Want your practice to stand out from others in your area? 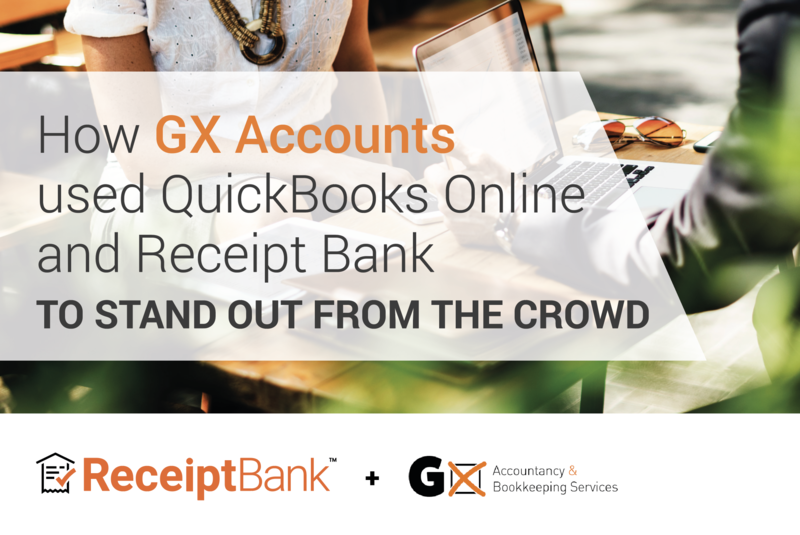 Register for one of our webinars today to see Receipt Bank in action and experience effortless bookkeeping in action.